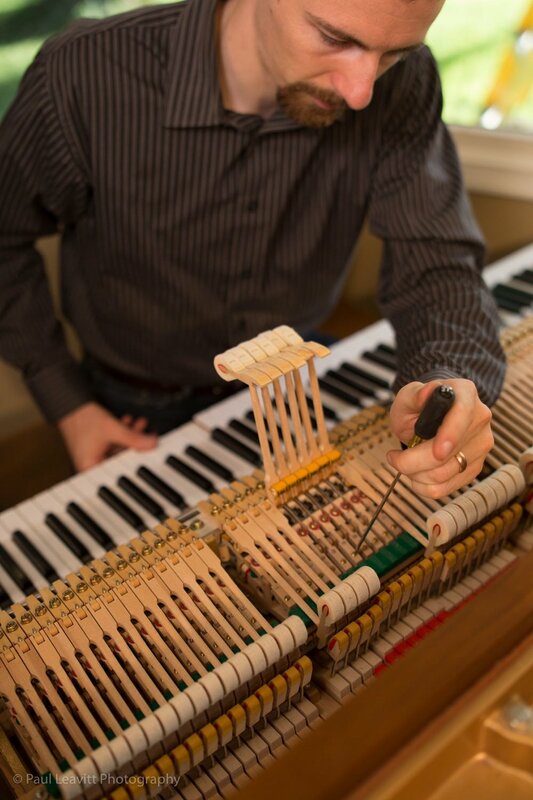 Hi, I'm Ross Leavitt, and I provide professional piano tuning, repair, and restoration in the greater Eugene and mid-Willamette Valley areas. My goal is to make your piano sound the best it possibly can, while ensuring we stay in your budget. I made a career of satisfying the most discriminating pianists at the University of Michigan School of Music, while also maintaining a private clientele in the local community. I’ve now returned to my hometown in Springfield, and am leaving a trail of satisfied piano-lovers in Oregon. Whether you have a beautiful Steinway grand, a well-loved upright, or even a piano you just got for free, I look forward to serving you. Contact me today to schedule an appointment! While completing my undergrad in saxophone performance at the University of Michigan School of Music, I studied piano tuning and repair with the head piano technician, who became my mentor. In 2008, I began tuning for friends in school and others in my network of local musicians. When I graduated the following year, I decided there were better ways to earn a living than playing the saxophone and accepted a full-time position as a piano technician working under my mentor. During my employment at the University, I was charged with maintaining 35 Steinway grands, as well as over 40 uprights. Though they all saw heavy use in the music school classrooms, performance halls, and practice rooms, many of them were played by top-caliber pianists with demanding tastes. My job was to not only respond to their requests, but to keep one step ahead of them, anticipating just what could be done to each piano to take it to the next level. And with a busy schedule, time and efficiency were paramount. While at the University, I continued to serve local piano owners, making available to them the same arsenal of techniques I used on high-end pianos. Now that my wife and I (and our new son, Patrick!) have settled down in Springfield, I continue to bring the same high level of service to piano owners in Oregon. When I sit down at your piano, I will first give it a beautiful tuning, but I won’t stop there. As I work, I will be asking myself what else I can do next to make it sound even better. Maybe it needs some voicing by softening crispy hammer felt, or maybe some quick regulation will make the keys feel more responsive. Perhaps there's a broken string or sticking key I need to address. Usually I find some tasks that can be completed in less than 10 minutes for no extra charge. If there are bigger improvements that I think would be worthwhile, I’ll discuss them with you afterward. If you suspect your piano will need more than the usual work, I will allow extra time for your appointment. Some projects are flat rate, others are hourly. I want to work with you to make your piano perform beyond your expectations, while staying within your budget. My main service area is greater Eugene/Springfield. However, I travel to Corvallis and Albany often, and anywhere else within roughly two hours of Springfield is a possibility. If you live outside the Eugene area, I can travel to you for an extra charge, but this can be reduced or eliminated if I have multiple clients near you. Just contact me for a quote. I am regularly in the Denver area visiting my wife's family, and I have a growing clientele that stretches from Aurora to Colorado Springs, and even into Fort Morgan and Evergreen. If you are in this area, I would be happy to add you to my schedule for my next visit. Please note that I have a different rate structure for service in Colorado, because of the extra logistics and planning involved. Contact me for pricing. I would love to hear from you, whether you have a question about your piano or would like to schedule an appointment. To ensure up-to-date scheduling info, I only schedule appointments by phone. If you simply have a question, you can also send me an email or use the form below.